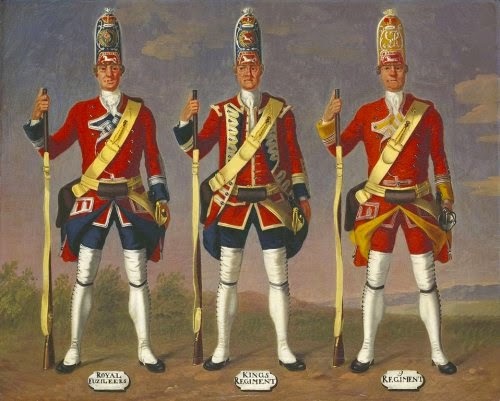 David Morier was a painter of portraits, military subjects and historical scenes who started working for William Augustus, Duke of Cumberland in 1747, when he painted a series of pictures of troops under his command. 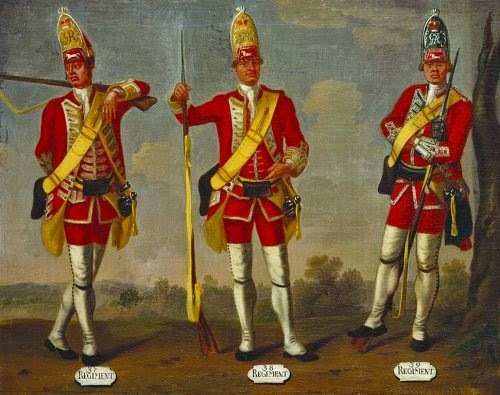 From 1752 until 1764 he was employed as painter to the Duke on an annual salary of £100, his name also appears regularly in royal accounts from 1764 to 1767. 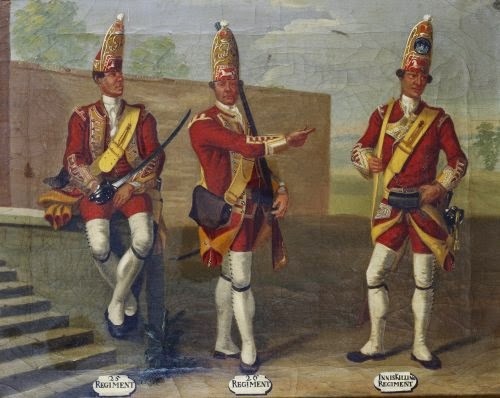 Three Grenadiers, standing, facing the front in a landscape, one of them reclining against a tree on the right, an embracing couple are sat down on the left, in the distance, groupings of what are presumably soldiers can be seen to be congregating. 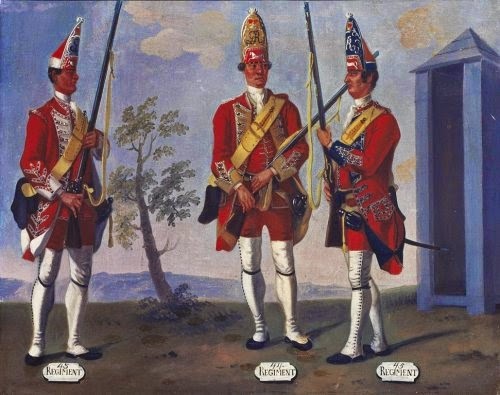 Three Grenadiers, standing, facing the front, in a landscape, with an comprehensive stockade wall on the left, and a church spire on the far side, they are standing at the port. 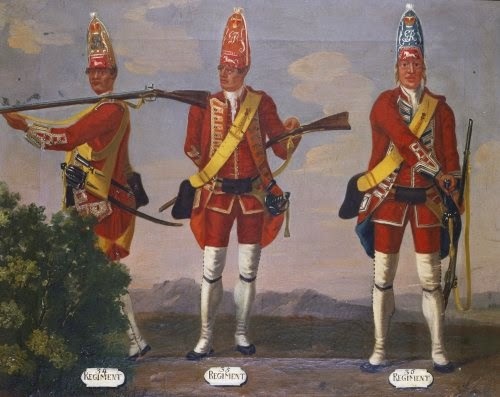 Three Grenadiers, standing, facing the front, in a landscape with trees on the left, they stand holding their muskets beside them in their right hands. 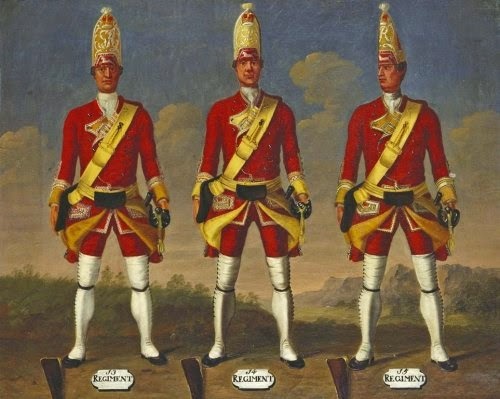 Three Grenadiers, standing, facing the front, in an open landscape, they are standing with muskets slung. 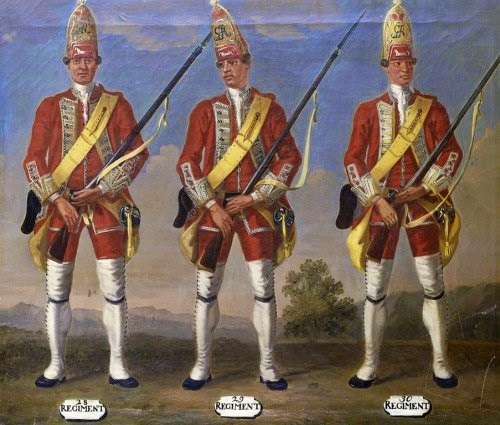 Three Grenadiers, standing, facing the front, in a forested landscape, they are standing with their hands by their sides and the butts of their muskets visible at their feet, on the ground before them. 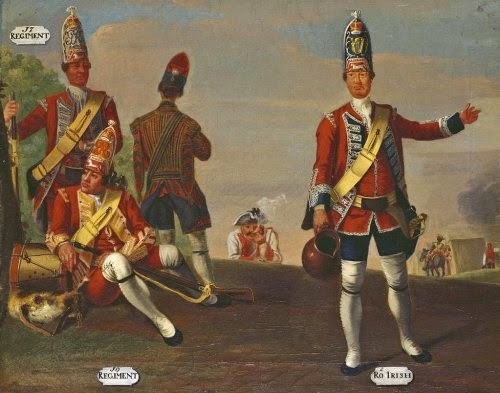 Five soldier, resting on an embankment in a landscape, on the left, a drummer is sat down with his drum beside him, in the foreground, a soldier holds a pitcher, another lies smoking at the top of the slope. 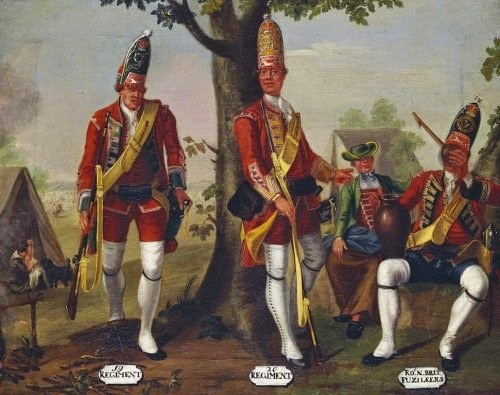 Three Grenadiers, at rest beside a tree in a military campsite, on the right, a seated soldier drinks from a ladle as he balances a pitcher on his right knee, a standing soldier points to a woman seated next to another soldier. Three Grenadiers, standing, facing the front, in an extensive landscape with a cottage on the left, the soldier on the left leans against a large barrel, military manoeuvres are being carried out on a plain in the background. 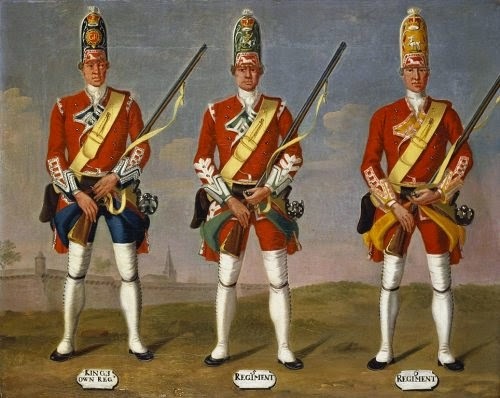 Three Grenadiers, in front of a wall over which is a view of an extensive landscape, on the left, one of them is sat down on a the stone balustrade of a flight of steps, holding his sword in his right hand. 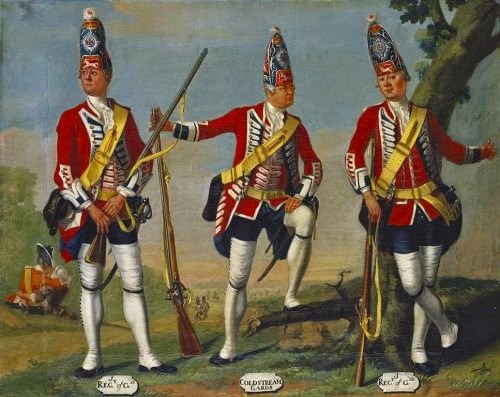 Three Grenadiers, standing, facing the front, in a landscape, with a central tree beyond, the Grenadiers are all holding their muskets at the waist, pointing to the right. 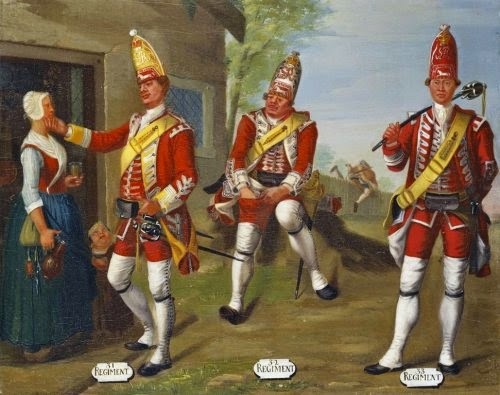 Three Grenadiers, at a cottage doorway, one of them, touching a young woman under the chin, is watched by a second Grenadiers sat down behind them and by the woman's small child, both standing in the doorway, a figure climbs over a fence on the far side. 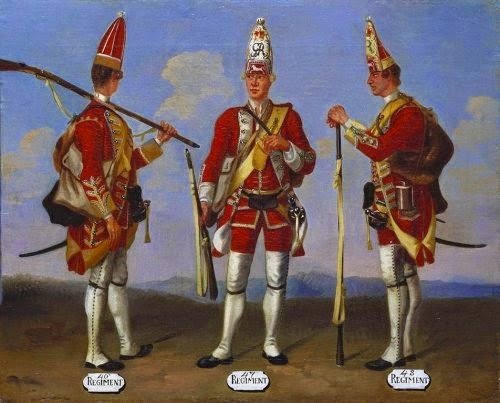 Three Grenadiers, standing in a landscape, with a bush in the foreground on the left, on the left, a Grenadier walks to the left, his musket on his shoulder, in the centre, another, holding his musket behind his back. 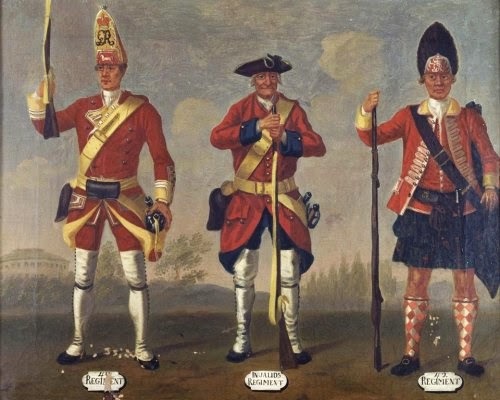 Three Grenadiers, standing, facing the front, in a forested landscape, the soldier on the right leans against a tree trunk, whilst the figure on the left walks to this right, with his musket slung across his left shoulder. 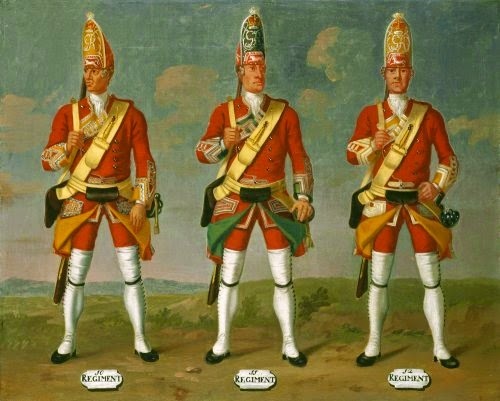 Three Grenadiers, standing in a landscape with a tree in the centre and a sentry box on the right, the soldier on the left faces half to the right, the central soldier faces the front and the third soldier faces half to the left. 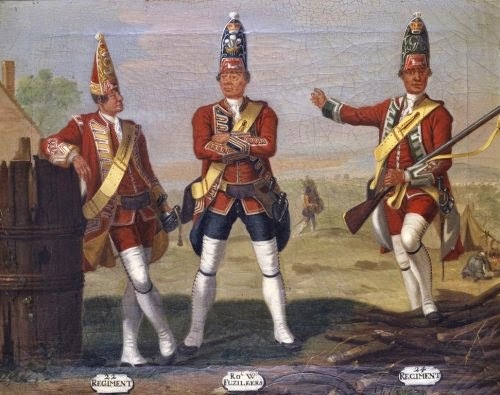 Three Grenadiers, standing, in an extensive mountainous landscape with a sentry box visible on the extreme left, the soldier on the left faces three-quarters to the rear and holds his rifle over his shoulder. 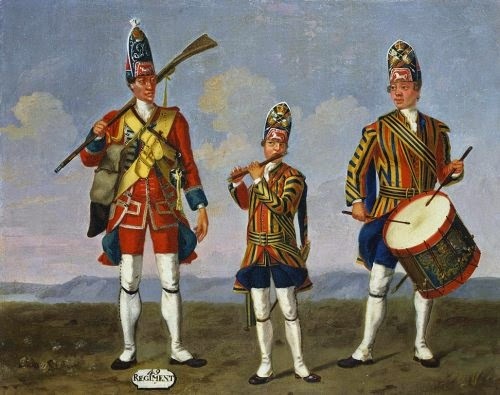 Three Grenadiers, standing, facing the front, in a landscape with hills beyond, the Grenadier, 49th Regiment of Foot, holds his rifle over his right shoulder, the Fifer, wearing a striped coat, plays his fife.